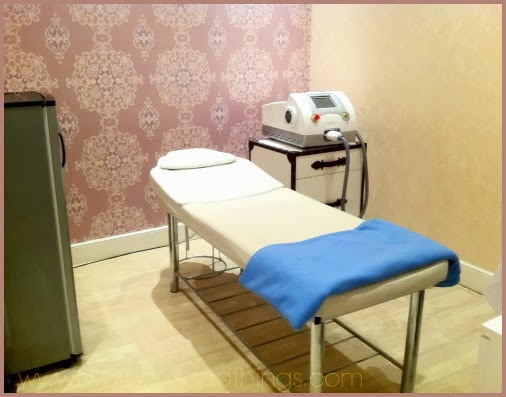 So if you read my blog closely you would know that I have had experience with IPL treatment which is my current favorite way to remove unwanted hairs. For you who doesn't know it yet, IPL stands for Intense Pulsed Light, a modern technology in the beauty world usually used for hair removal or skin rejuvenation treatment. For hair removal treatment, this IPL technology is said to be able to remove your unwanted hair permanently. But since I haven't fully experienced it so I can not personally vouched for that. But I do know that IPL is kind of a miracle in hair removal treatment because I can see that it really does work towards permanent removal of those unwanted hairs. It works by penetrating intense pulsed light deeply into the hair follicle that makes it grow slower and much thinner, and would gradually stop permanently. So it usually took several times of treatments to get the permanent result. I personally have done an IPL treatment for 3 - 4 times now and I can already see a very huuuge different on my underarms where I did the treatment for the last several months. I have tried different places to do this IPL treatment and one of them is at Touch Beauty Clinic in FX Lifestyle X'nter Sudirman, Jakarta. The inside is even lovelier and very cozy with a waiting corner (perfect for your guy to wait for your treatment) complete with a sofa and TV. There are only two treatment rooms in this clinic, one for hair removal and the other one is for doctor consultation and skin treatment / face rejuvenation. So you have to call and make appointment first before you came to make sure that you don't have to wait long. I made the reservation by phone and when I went there I was greeted very warmly and then ushered to the treatment room immediately. There were nobody there but me because it was my appointment hour. I chose the underarm hair removal treatment with the IPL technology. As this is my 4th time getting the IPL treatment so I kindly told the staff that they don't have to explain to me about IPL all over again. I was handled by a very friendly but professional staff called Desti that day. She gave me great service and did a very thorough job with the IPL treatment. When doing an IPL treatment, firstly you have to change into something more comfortable of course. They provide a salon cloth for you but I always wear tanktop when I went for an IPL so I don't have to change my clothes and save time. After you changed clothes, if you haven't shaved the area you want to treat then the staff would shave and clean it first, and then they would wipe a damp cloth before putting on a very thick layer of gel on the area that you want to treat. This gel's function is to absorb the heat caused by the IPL machine so that your skin won't get shocked and irritated. They would also put a specialized glasses for you to avoid exposure from the IPL light. With a thick gel layered on my underarm I almost couldn't feel the hot IPL machine. I only felt a little warm, and probably because this is already my 4th time so I don't really feel the tingly electrifying feeling anymore. But if it's your first time then be prepared to feel a little bit of sting. You can always tell the staff if it's too hot or too stingy for you because then they would lower the level. The whole process only took about 15 minutes for underarm treatment so it's a very time-saving treatment compared to waxing treatment. Unlike waxing which caused irritation and sensitivity afterwards, with IPL there's no irritation or redness after treatment. So I really prefer IPL to waxing. Compared to waxing, IPL also gave much greater result with just 15 minutes of treatment. Usually with waxing my hair would grow back in about 3 - 4 weeks, but with IPL treatment my hair seems to not grow back ;) These results are of course different to every person depending on their hormones. The staff said that my treatment is quite fast because there are already only about 5% of hair left on my underarm now and that was just from 3 times of treatments. Some women needed minimal 4 - 5 treatments before their hairs started to grow really slow. So basically everybody is different, but nonetheless you would see a huge difference on your hair growth from the first treatment, and the result would keep on gradually keeps getting better, and you would gradually see less hair after every treatment until they're totally gone away. 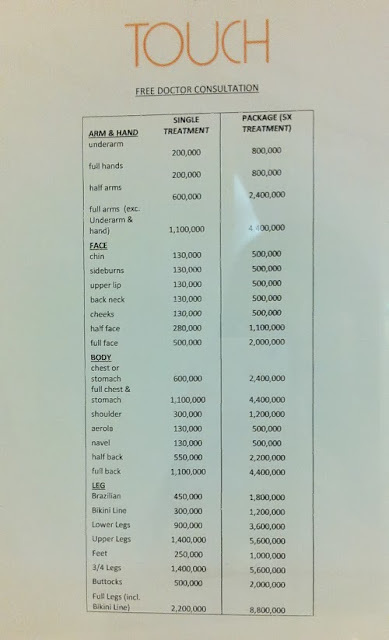 One underarm treatment costs IDR 200,000 and there are packages available with cheaper prices. 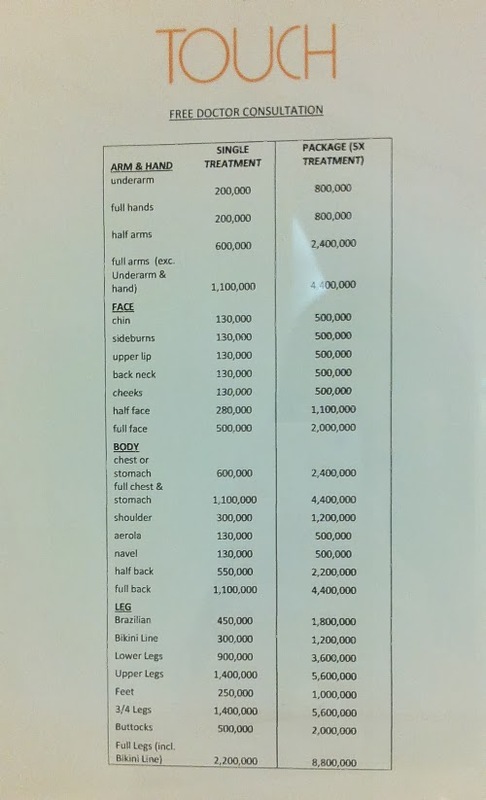 Above are the total price list for Hair Removal treatment at Touch Beauty Clinic (you can click the pic for clearer image). Aside from hair removal treatment, Touch Beauty also offer skin consultation with their in-house doctor and their signature skin treatment solutions such as the popular face rejuvenation treatment. Remember, the doctor consultation is counted as Free! 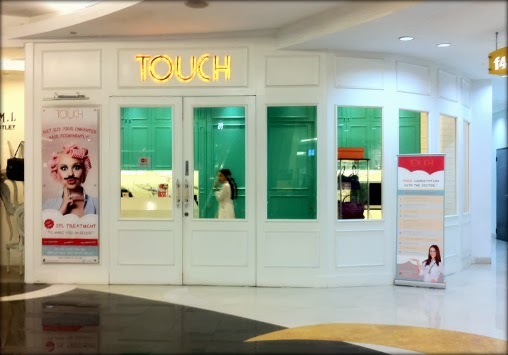 Overall, I really love my experience at Touch beauty clinic. Trust me, I've had bad experience with a beauty clinic before that makes me never want to go there again, but after my wonderful time at Touch I truly recommend this place if you want to try the IPL treatment or another skincare treatment available. Thank You so much Touch!